Should Edward Snowden Be Thrown in Jail For Leaking NSA Data? According to the “biographies” released with his confession yesterday, Edward Snowden is a 29-year-old high-school dropout who trained for the Army Special Forces before an injury forced him to leave the military. His computer credentials are apparently limited to a few classes he took at a community college in order to get his high-school equivalency degree. His first job at the NSA was as a security guard. Then, as the peter principal describes, he moved the United States’ national security infrastructure: The CIA gave him a job in IT security. He was given diplomatic cover in Geneva. He was hired by Booz Allen Hamilton, the government contractor, which paid him $200,000 a year to work on the NSA’s computer systems (for approximately three months). Snowden is not an FBI or CIA investigator, nor is he a national security or privacy attorney. He is just a guy who feels Barack Obama did not keep his promises and that the US is trying to spy on the entire world. Leading Republicans in the House have called for the extradition of the man at the heart of the National Security Agency information scandal, Edward Snowden, who is in Hong Kong. The US has an extradition treaty with Hong Kong but there is an exception for “political prisoners.” In the end that is Hong Kong’s decision not the United States’. 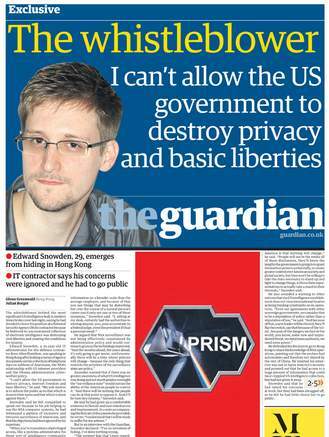 So the question becomes, should Snowden be thrown in Jail for leaking of the NSA data. The answer has to be yes (even though I strongly disagree with the broadness of the NSA program). In his interview Mr. Snowden said he did not turn over any information that could end up hurting an individual (the way the Wikileaks info lead to the execution of people helping the west). Snowden doesn’t have the knowledge, background or experience to decide what kind of information could or couldn’t be leaked without damaging individuals. He had only been working on this project for three months, barely long enough to discover where the NSA bathrooms were. Can someone with Mr. Snowden’s lack of expertise really decide what can be released without damaging the anti-Terrorism activities of the United States? If Snowden is given a pass, does it give other NSA or CIA employees “Carte Blanche” to reveal other more damaging secrets? I would have been more comfortable with Snowden’s leaks if he had gone to someone like Senators Rand Paul or Ted Cruz with the information. As libertarians they would have run with the information without leaking the details. And if they didn’t well then he could look for a more public way. The NSA program of downloading the phone call information of each and every American phone call is much broader than anyone thought—even broader than the supporters of the patriot act. I believe that it is an affront to the Fourth Amendment to the Constitution. However wrong it is—it is also very “legal.” A FISA judge approved the action (incorrectly IMHO). Revealing classified information is not legal, even if it reveals data on a program I disagree with. Congressman King is correct, the US should be trying to extradite Mr. Snowden and put him on trial.